By simply Telling Us Your Story using the fast and fun ProConCloud process, you can now discover the limiting assumptions or beliefs behind your own or other's past decision mistakes. In this video we witness the Professor sharing the history, development and first two steps of the ProConCloud process, also called the Change Matrix Cloud (CMC) process, with Jason, a long term friend. When Jason returns to the Professor after completing Step 1 and 2 of the ProConCloud process, he still has unresolved conflicts. The Professor assists him in solving his remaining conflict in with a win:win outcome and not to settle on just the option of compromise. 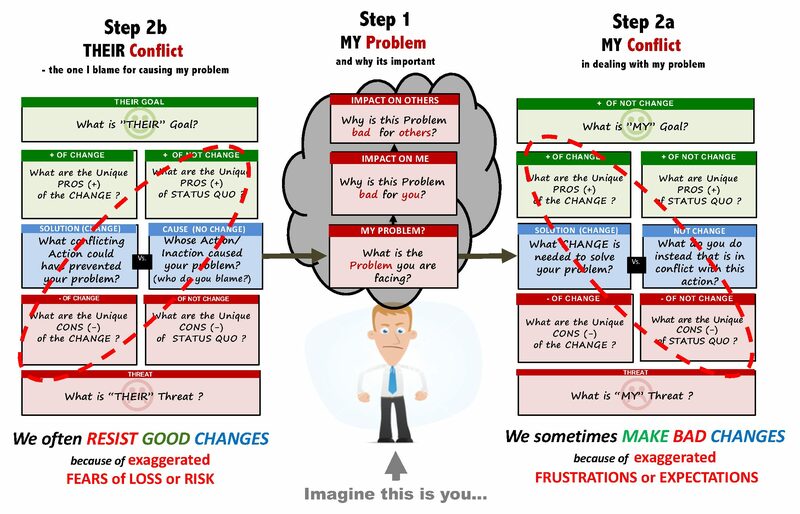 TheProConCloud Process consists of 5 steps, each designed to overcome one of the 5 most common decision mistakes we make which wastes our scarcest resource – our limited attention. This video provides an overview of the Harmony Decision Maker and how it can help individuals and organizations make better faster decisions by guiding them through the 5-step ProConCloud decision- making process. If you want to try out the ProConCloud process to solve your conflicts, why not register for a free trial on our online software platform that automates the entire process for you?